BRUSSELS (A.W. )—On March 3, the European People’s Party (EPP) adopted a resolution recognizing and condemning the Armenian Genocide. According to the press service of the European Friends of Armenia, the resolution calls on Turkey to recognize and condemn the genocide committed by the Ottoman Empire as a basis for the complete normalization and Europeanization of its relationship along with its international commitments and European aspirations. The European People’s Party (EPP) adopted a resolution recognizing and condemning the Armenian Genocide. The resolution pays tribute to the victims of the genocide and appeals to international organizations, especially the European Union, as well as Council of Europe (CoE) member states, to restore historical justice and pay tribute to the victims. 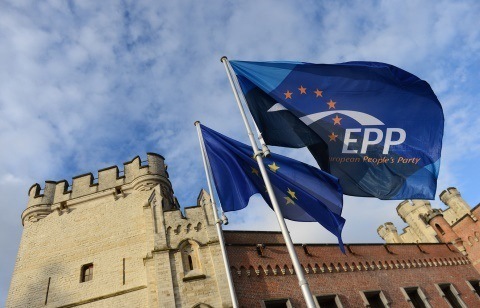 The EPP Summit took place on March 2-3 in Brussels, Belgium. Armenia’s delegation included Armen Ashotyan and Artak Zakaryan of the Republican Party of Armenia (RPA), Mher Shahgeldyan of the Rule of Law Party, and Raffi Hovannisian of the Heritage Party. Speaking to Panorama.am, Armenia’s Minister of Education and Science, Armen Ashotyan, stressed the importance of the ruling. “This support from Europe’s ruling political force is of key importance for the Republic of Armenia and the Armenian people. The resolution’s title suggests that the largest European political family, the EPP, in its policy is also guided by the value system which is the basis of the ideology of Armenian Genocide recognition: recognizing and condemning the Armenian Genocide, paying tribute to the tragedy’s victims, as well as calling on Turkey to confront its past and build up future with its neighbors, overcoming the past,” he said. “I would like to emphasize that this success was achieved due to joint efforts of all political forces represented in the EPP. I express my gratitude to our partner parties. We are able to unite and push forward our national interests, leaving aside party disagreements, which are quite natural in the political struggle,” Ashotyan said, adding that the resolution was passed unanimously. The EPP is a European political party that was founded by Christian Democratic parties in 1976. It has been the largest party in the European Parliament since 1999, and in the European Council since 2002. It is also the largest party in the current European Commission. Below is the draft resolution tabled by the Armenian delegation to the EPP Political Assembly. The European People’s Party reaffirms its recognition and condemnation of the genocide and great national dispossession of the Armenian people on the eve of its 100th anniversary on April 24, 2015. 1- We condemn the genocidal acts against the Armenian people, planned and continuously perpetrated by the Ottoman Empire and various regimes of Turkey in 1894-1923, dispossession of the homeland, the massacres and ethnic cleansing aimed at the extermination of the Armenian population, the destruction of the Armenian heritage, as well as the denial of the genocide, all attempts to avoid responsibility, to consign to oblivion the committed crimes and their consequences or to justify them, as a continuation of this crime and encouragement to commit new genocides. 2- We commemorate the one-and-a-half million innocent victims of the Armenian Genocide in 1915 and bow in gratitude to those martyred and surviving heroes who struggled for their lives and human dignity. Moreover, we recognize that the genocide resulted in the death and dispossession not only of Armenian people but also extended to the Pontic Greek and Assyrian peoples, and we commemorate them as well. 3- We join and strongly support the commitment of Armenia and the Armenian people to continue the international struggle for the prevention of genocides, the restoration of the rights of people subjected to genocide and the establishment of historical justice. 4- We invite Turkey, in the finest example of integrity and leadership proffered by the Federal Republic of post-war Germany, to face history and finally recognize the ever-present reality of the Armenian Genocide and its attendant dispossession, to seek redemption and make restitution appropriate for a European country, including but not limited to ensuring a right of return of the Armenian people to, and a secure reconnection with, their national hearth―all flowing from the fundamental imperative of achieving reconciliation through truth. 5- We call upon the government of Turkey to respect and realize fully the legal obligations which it has undertaken including those provisions which relate to the protection of cultural heritage and, in particular, to conduct in good faith an integrated inventory of Armenian and other cultural heritage destroyed or ruined during the past century, based thereon to develop a strategy of priority restoration of ancient and medieval capital cities, churches, schools, fortresses, cemeteries, and other treasures located in historic Western Armenia, and to render the aforementioned fully operational cultural and religious institutions. 6- We appeal to EU and CoE member states, international organizations, all people of good will, regardless of their ethnic origin and religious affiliation, to unite their efforts aimed at restoring historical justice and paying tribute to the memory of the victims of the Armenian Genocide. – to launch the long-awaited celebration of the Armenian national legacy based on a total Turkish-Armenian normalization anchored in the assumption of history, the pacific resolution of all outstanding matters, and a complete Europeanization of their relationship. 8- It also invites the European Union, its Commission, Council and Parliament, and the international community as a whole, in assessment of the honoring of commitments and obligations undertaken by Turkey, to accord continued attention to the recognition, restoration, and restitution of our shared heritage as herewith tendered, and hereafter officially to commemorate April 24 as a day to remember and condemn the Armenian Genocide and man’s inhumanity to man. 9- We express the hope that recognition and condemnation of the Armenian Genocide by Turkey will serve as a starting point for the historical reconciliation of the Armenian and Turkish peoples. You are currently subscribed to reconcile-this as: mirak.weissbach@googlemail.com.